It must take a lifetime to learn how to make the exact amount of rice you're going to eat or serve in one sitting. Chances are you're not there yet, but you have learned to sensibly err on the side of too much rice, the result being varying amounts of leftovers. 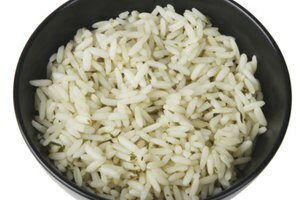 First things first – get that extra cooked rice into the refrigerator, stat, because room-temperature grains are a notorious culprit for causing food-borne illness, harboring bacteria that can't be killed by cooking. With that task complete, move on to planning a delicious dessert you can concoct with leftover cooked rice, milk and not much else. It's the comforting classic, rice pudding, a very simple and easy-to-make confection that's also ideal for customization. Stick with a one-to-one rice-to-milk ratio and substitute in any kind of rice (try brown rice for the health benefits of whole grains) and any type of milk, including non-dairy milks like almond, coconut, soy or oat milk. The sweetener is up to you, too. 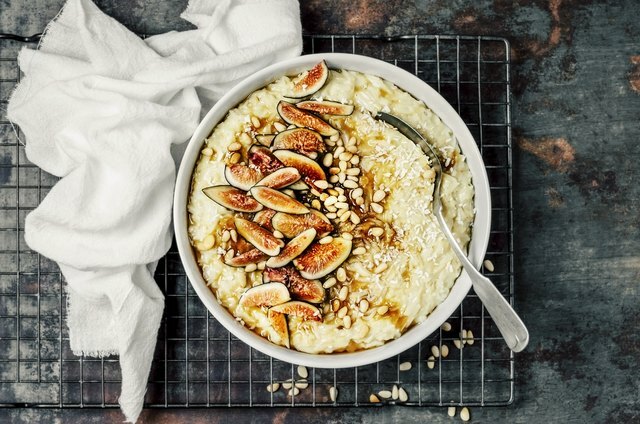 Whether you reach for regular sugar, brown sugar or your favorite syrup in small or liberal doses, rice pudding welcomes it all. Further, you can raid your pantry and fridge for extra ingredients to put in and on your rice pudding. Go for a protein boost at breakfast with a swirl of peanut butter and potassium-rich banana sliced on top. Or, get your antioxidant fill of fresh berries on top of rice pudding for dessert, complemented by a dose of ginger and lemon zest cooked into the mix. The possibilities are endless with this ideal use for leftover rice. In a medium saucepan over medium heat, stir together the rice and milk. Keep stirring until the milk begins to boil. Reduce the heat so that the milk is barely simmering, and continue to stir the rice and milk often as they simmer together. Stir in the pinch of salt and the sugar or other sweetener, starting with 1 tablespoon. 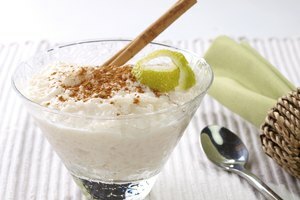 Taste the rice pudding and add more sweetener, a little at a time, until it reaches your desired level of sweetness. Stir in any optional extra ingredients of your choice. 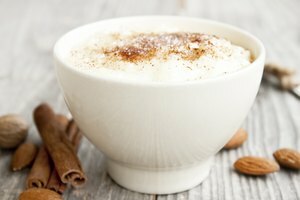 Cook the rice pudding until it's thick and very soft, with the rice grains mostly broken down and well-combined with the thickened milk, about 15 to 20 minutes in total. Serve the rice pudding warm with optional toppings, or transfer it to the refrigerator to cool. It will keep in the refrigerator, covered, for several days.